Smooky Margielaa's star-studded "Flight To Memphis," which features A$AP Rocky, Chris Brown, and Juicy J, debuts at #1. 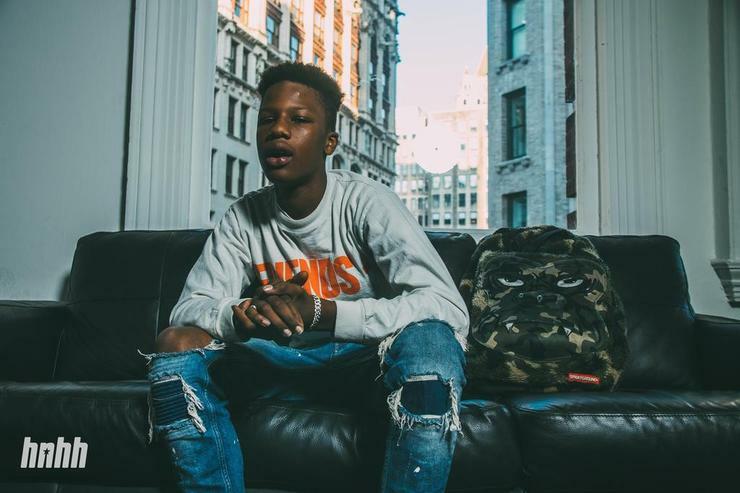 Is 2019 going to be Smooky Margielaa's year? The Bronx rapper, who counts A$AP Rocky as a mentor and is currently only 16 years old, has amassed some buzz thanks to his A$AP Mob affiliation and Cozy Tape Vol. 2 guest spots, but only has just over a dozen Soundcloud loosies to his name. Over on the HNHH weekly chart, he's never so much as sniffed the top ten as a lead artist, and only come close a few times as a guest. This week, his biggest track as a lead artist changes that, giving Smooky his first #1. Perhaps a sign of things to come? XXXTentacion and Meek Mill are the only artists with multiple appearances inside the top ten, with two apiece. New tracks barely missing out on spots this week include A Boogie Wit Da Hoodie's "Look Back At It" (#11), Lil Baby and Gunna's "Ready" (#12), Chief Keef's "Awesome" (#14), and Stylo G, Nicki Minaj, and Vybez Kartel's "Touch Down" remix (#15). This has to be a first: a song with predominantly backwards lyrics making the top ten. This cut from X's posthumously released album Skins is his second mourning the loss of Jocelyn Flores, and it debuts at #10. 9. Kyle Feat. Lil Yachty - Hey Julie! From the team that brought you the 2017 hit "iSpy" comes another "happy rap" radio play, this time entitled "Hey Julie!" This latest collaboration between Kyle and Yachty debuts at #9. Sneakk, an SOB x RBE affiliate who missed out on most of that group's buzz in the past year, is now making his play for the spotlight. "Spray," a new single that features Cali heavy-hitters Tyga and YG, debuts at #8. The second cut from X's Skins to make our top ten this week is the Kanye West-assisted "One Minute." It debuts at #7. Earlier this year, Ice Cube made his first appearance inside the top ten in quite a while, delivering a fiery anti-Trump screed entitled "Arrest THe President." His second 2018 appearance is much more light-hearted, a cut from his new album Everythang's Corrupt entitled "That New Funkadelic." It debuts at #6. For the first of two cuts from Meek Mill's Championships appearing on this week's chart, the Philly rapper teamed up with "Boo'd Up" singer Ella Mai over a Beyoncé sample on a track called "24/7." It debuts at #5. Rich The Kid's been relatively quiet since the release of his album The World is Yours earlier this year, and now we know why. Last week, he announced that a sequel is due next month, and accompanying that announcement was a new single entitled "Splashin." It debuts at #4. Two splash-related songs in a row! On the most guest-heavy cut from Championships, Meek calls upon Future, Young Thug, and Roddy Ricch for quite the posse cut. The resulting "Splash Warning" debuts at #3. The only repeat from last week's list, Offset's "Red Room" certainly benefits from the fact that the original track was taken offline shortly after being posted. Last week, a seemingly more official version arrived, further boosting the song's views. In its second week out, the track is down one place from #1 to #2. Smooky's first big chance to carry the torch as a lead artist definitely goes over well on the star-studded "Flight To Memphis." The new single debuts at #1 on our chart.